Heidi Ferguson surveyed a group of blog readers to find out their habits regarding reading craft blogs, the level of reader participation in blog promotions, and their habits regarding social media (Facebook, etc.). Here she shares the survey results, as well as some conclusions she has drawn that can help us understand our readers and reach them the way they want to be reached. I love surveying people. I am fascinated by the mundane things that people do everyday that yet somehow make them unique. And even more than that, I love learning what simple day-to-day things MY readers do that impact my own life. Because I am a blogger. Today I am not here to discuss Google Analytics or any of those statistic-keeping sites. I am simply here to share the results of a recent survey I conducted about Social Media and Blogging. I was fascinated by the results, and I would love to share them with the rest of the craft blogging world–because we work so hard to make our blogs grow, what can hurt by learning a little more? Question 1: How often do you read craft blogs? 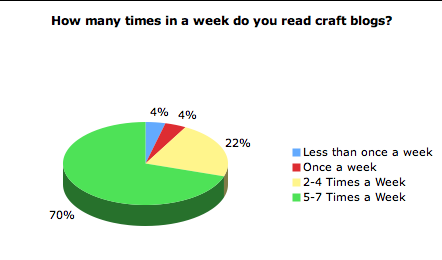 As the graph shows, a very large majority (70%) of the population reads craft blogs 5-7 times a week while only 4% read less than once a week. This question might be slightly skewed since those who read frequently are more likely to have seen the survey on my blog. However, I still feel there is a lot of value in these answers. Question 2: Do you follow craft blogs through Google Friend Connect or RSS feed? This was an interesting answer…it was pretty close. The least amount of people followed through GFC (18%) and RSS feed was at 27%. That matches most blogs that have both options (you’ll notice that you usually have more followers through your RSS feed.) 22% said they follow through both GFC and RSS feed, but 33% said neither. Which begs the question…we have 33% of readers who do not use neither GFC or RSS…how can we encourage them to follow us and increase our readership? Question 3: Do you like giveaways on craft blogs? I was actually surprised to see that 42% of readers like giveaways and enter them once in awhile. I suspected that readers were getting sick of giveaways. 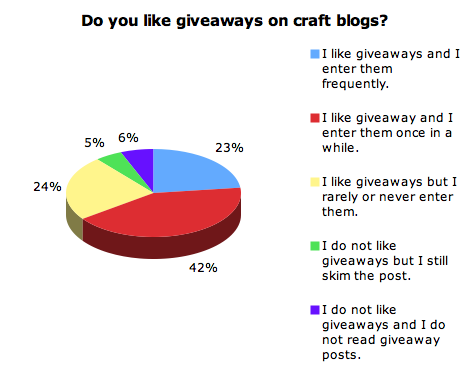 However, we can tell our sponsors that nearly half of craft blog readers still enjoy giveaways. 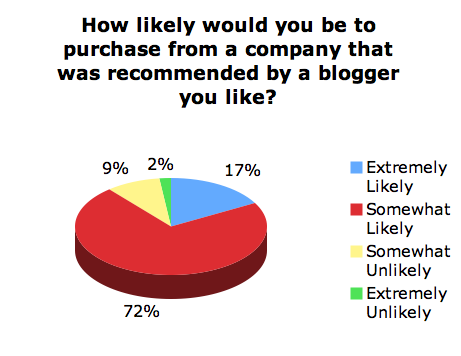 Question 4: How likely would you be to purchase from a company that was recommended by a blogger you like? This is good news to tell our sponsors! Companies always wonder how much power of influence a blogger has when they are considering sponsorship. If you feel that your readers trust you, approximately 72% of them will be somewhat likely to purchase from a company that you recommend…17% would be extremely likely! Question 5: Are you on Facebook? 72% of the population said Yes, and they use it all the time. 13% said Yes but use it infrequently. 5% said yes but use it rarely. And 6% said no. 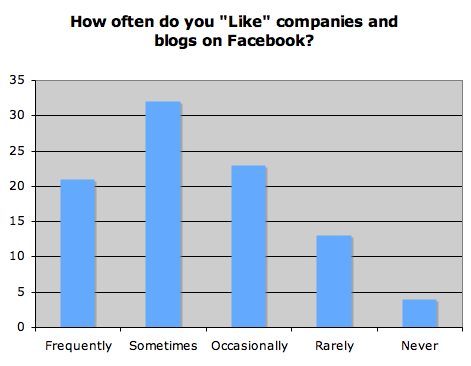 Question 6: How often do you “Like” companies and blogs on Facebook? 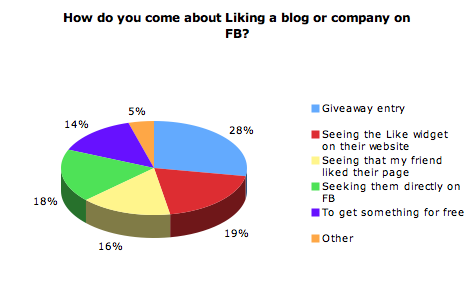 Facebook is such an important tool that we as bloggers (and business owners) have to connect with our readers. But how can we connect with them via FB if they do not ‘Like’ us? According to these results, most of the population is reasonably willing to “Like” us on FB, but we need to be sure to give them the opportunity. So how can we get them to Like us? 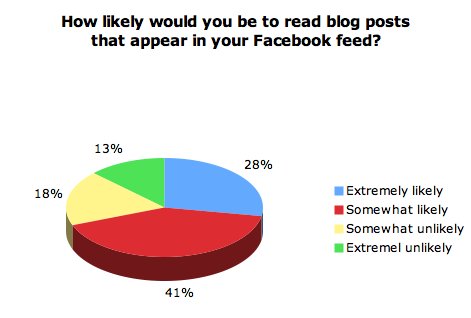 Question 7: How likely would you be to read blog posts that appear in your FB feed? Another reason to make sure that your blog posts are going to your Fan page. You can do this through Networked blogs, but there is some debate whether or not posting directly to your wall will give you more hits and views. It’s nice to have it setup through Networked blogs just in case you forget or don’t have time to post directly to your wall. Question 8: How often do you engage in Facebook conversation with companies and blogs? I was a little discouraged by these results. One of my favorite things to do on my FB fan page is to ask questions or post links that will stir up conversation. Creating conversation encourages loyalty and strengthens the community. 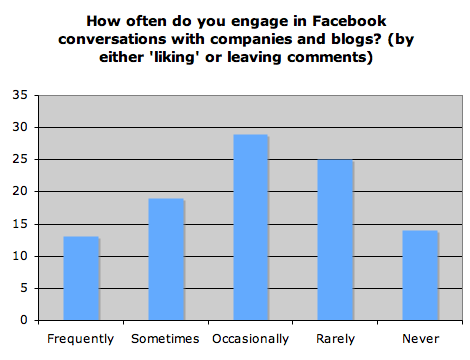 How can we engage our FB fans enough to participate in conversations? Question 9: How do you come about Liking a blog or company on FB? This was pretty close across the board. I’m always curious about how to best grow my FB fan page. However, 19% of the population became a fan by the method of a blog widget. Make sure you have your FB page widget on your blog! What other methods have worked the best for you to increase your fan base? They have become much more creatively inspired by reading craft blogs. They have learned many creative skills through craft blogs, including cooking skills, decorating tastes, sewing skills, etc. They enjoy the interaction and relationships with other like-minded women and keeping up with their friends and family through Facebook. I hope that you found some useful information from this survey. Please leave a comment of your thoughts about social media and how you feel your readers have best responded to your efforts. After all, without each others help, where would we be? Heidi blogs at HoneyBear Lane, shares inspired craft and sewing projects, and also writes about the handmade business. She wants to motivate women to take charge of their own creativity and gain the confidence to sew an amazing project, like her signature project, the puff quilt!